jQuery's find method is arguably the most used method in jQuery applications. Yet, when using .find() recently, I found out that it makes a rather weird exception for root element(s) of a document, that is, it ignores them. el will be empty here, because <div id="one"> is the root element. It would work if the element were nested inside, say, another div. In a recent project that uses .find() to apply progressive enhancement to parts of the page that have been updated through Ajax, this became a pain. To get the results we want, we need to combine .filter() and .find(). We don't care whether the element we're looking for is at the root or not. Most Ajax applications need to update parts of the DOM or perform some other action after they receive a response for their XHR requests. What's the problem with this? Well, when we update our <div id="message"> through Ajax, the notifications pop-up won't display. This is because the document ready handler is not triggered for mere updates to the page. By passing only the element that's changed we avoid having to somehow remember in function makeDropdowns which lists were already turned into dropdowns and which not. These takes quite some burden off of these functions. The problem that emerges as we add these more and more enhancement functions like makeDropdowns and displayNotification is that we keep adding slightly different code to both our document ready handler and to a number of success handlers that we might have created in our app. This sort of duplication of code is bad. Let's try to generalize a bit more. No longer do we now need to change the code of both of these whenever we add a new handler to node_changed_handlers. That's good. Still, writing individual success handlers for all sorts of different actions and Ajax requests, of which there are usually many in a modern web app, is cumbersome. Ideally, our success handler and the server could use some more intelligent protocol that would allow us to reuse the same success callback function for all our application's Ajax requests. In short, we want a success handler that we can use for all our Ajax needs. How does this work exactly? It looks for all elements in the server response's HTML with the class ajax-replace (line 3) and replaces elements with a corresponding id in the current DOM (lines 4 and 5). It then calls all node changed handlers with the newly added element (line 6). Voila! What we have here is a very powerful and simple success handler that's reusable for all our Ajax requests. I've recently added Ajax forms and Growl-like notifications (using the jquery-toastmessage-plugin) to the Kotti CMS, a user-friendly light-weight CMS that I'm building on top of Pyramid and jQuery. To see this code in action, log in to the Kotti demo server with the username owner and password secret and try the reorder form. What is the Lotsenprojekt die brücke? My sister works as a team leader in the Lotsenprojekt die brücke (German) in Berlin Mitte. The basic idea behind this project is to help less integrated people living in Berlin find their way through what can be an impenetrable public authorities system. die brücke helps these people with their everyday issues with finances, habitation and health, primarily by acting as a connector between them and the appropriate authority. Considering the real world impact that this project has, it's probably the most meaningful project I had the pleasure to work with yet. This is where I came in. 2010 was the first year in which die brücke used a database system for data entry and generating reports, in favour of filling out forms by hand and doing manual statistics with tally sheets and Excel. Furthermore, we've also implemented a searchable directory of authorities and departments which allows the team to increase their service quality. The departments statistics gives an overview of which authorities or departments the clients were brought into contact with, divided by client languages. 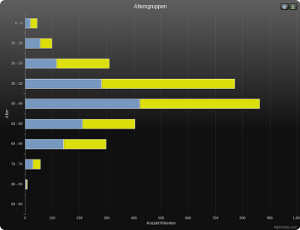 Here you can see that the Berliner JobCenter was the most contacted authority. The age overview allows you to see that most people seeking help with die brücke are between 30 and 50 years old. It also shows you how many of those people were male versus female. The tabs on the top of the page allow you to navigate to the other statistics. The data entry and reports were developed with Python, Django, jQuery, Highcharts, DataTables and with some bits of ExtJS. Django's admin interface turned out to be a good fit for data entry and a time saver.